Tomatillos are nightshade plants that love the summer heat. They’re native to Mexico but can be grown in most home gardens in North America, and are very popular in Texas and the southwest states. We’ve been growing tomatillos for several years and every year I’m amazed at how well they grow with very little care. A lot of people think that salsa verde (green salsa) is made with green (unripe tomatoes), it’s not. Salsa verde is made with tomatillos. Tomatillo plants are related to tomato plants but they’re not the same. The tomatillo is wrapped in a dry husk, which is why it’s often called husk tomatoes. While tomatoes are juicy on the inside when ripe, tomatillos are more fleshy and the skin is thinner. There are several varieties of tomatillo plants and when ripe their color will range from pale yellow to purple. Tomatillos are also not the same as ground cherries, although they are related and both have the papery husk around them (ground cherrie are also called husk cherries). Ground cherries have a sweet (some say, pineapple-ish) flavor and tomatillos are more tart and savory. 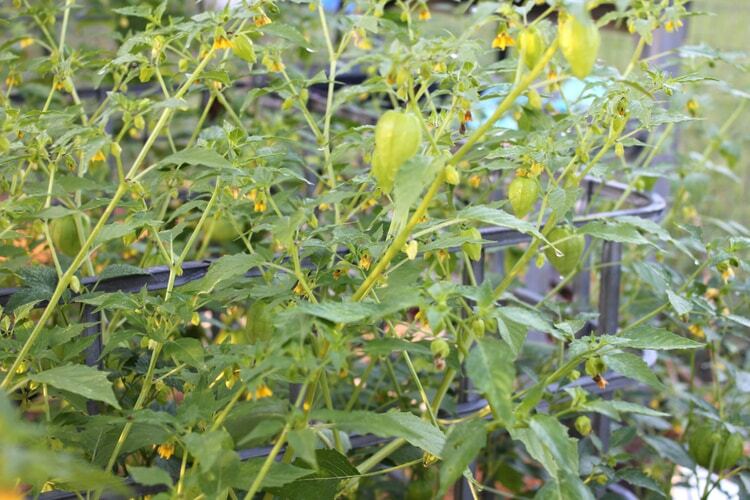 You’ll need at least two tomatillo plants as they need to cross pollinate with another plant (of the same variety) to produce. Each plant will produce about 2.5 – 3 pounds of fruit. You can use these worksheets to figure out how many plants to plant for your family, just fill out the form below and they’ll be emailed to you. Tomatillos love heat and need about 65-70 days to mature. They also prefer low humidity and sparce rainfall. We live in a very humid climate and they grow fine, so don’t let the “prefers low humidity” deter you from growing tomatillos. 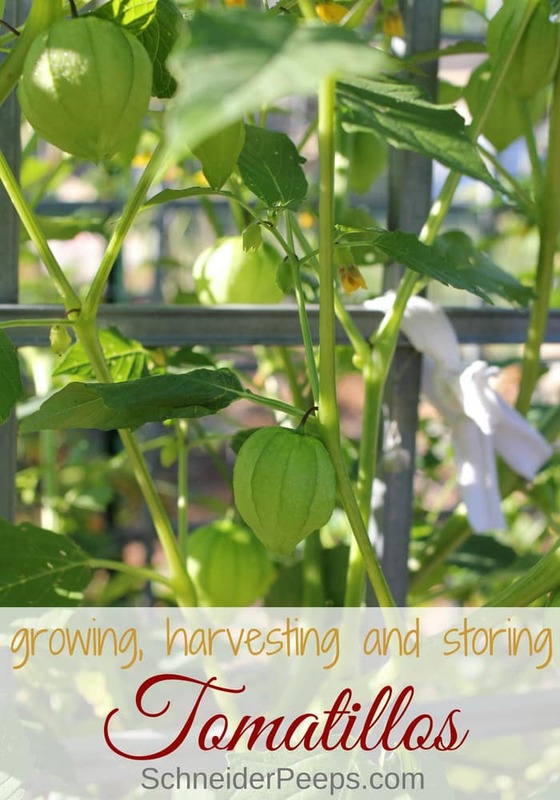 Tomatillo plants are easy to start from seed and are good self seeders. I use this soil blocker to start all our seeds; it’s one of the best garden investments I’ve made. If you live in a climate that has short growing season you’ll definitely want to start your tomatillo plants 6-8 weeks before the last frost date. It’s okay if they get a little leggy, so don’t worry if your winter lasts a bit longer than usual. Like tomato plants, tomatillo plants have “hairs” all long the stems and these hairs will grow into roots when planted. If your transplants are leggy, just plant them deeper and they’ll get sturdier. After all danger of frost is over, plant your tomatillo plants in full sun, which means at least 6-8 hours of direct sunlight a day. Tomatillos also like well drained soil and won’t do well in heavy clay soil that retains a lot of water. Lastly, just like planting tomatoes, I like to remove the first set of leaves and plant the tomatillo plants about 4-5″ deep. Tomatillo plants only need about 1 inch of water per week or even less. Too much water will kill the plant which is another reason to plant in well draining soil. 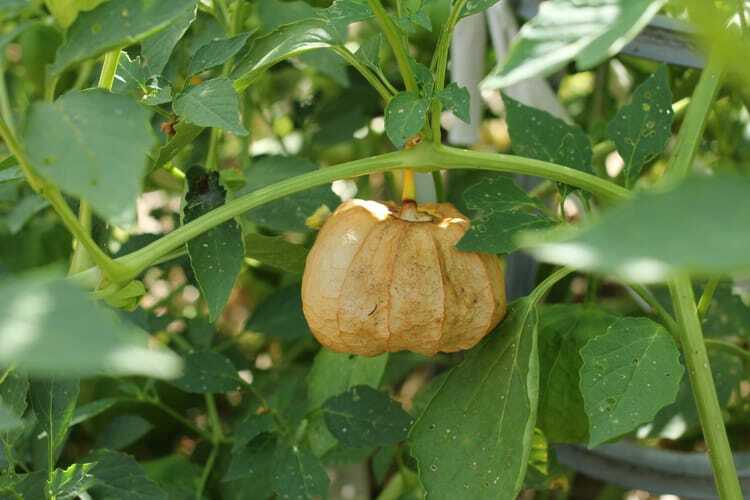 Tomatillo plants are not as heavy feeders as tomato plants are and there’s usually no need to top dress with compost or to fertilize them if you’ve planted in rich soil. If you have poor soil, you can build good soil over time. On of the most helpful things you can go when growing tomatillo plants (or any plants for that matter) is to keep good notes. 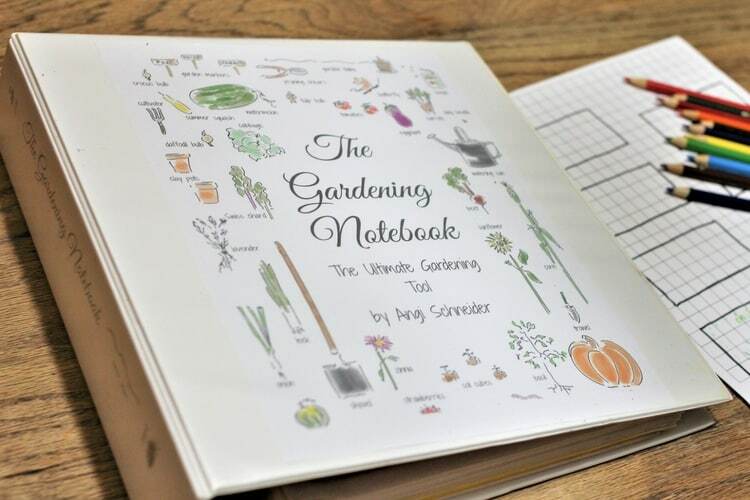 I like to use a gardening notebook to keep all my notes organized. For the most part, tomatillo plants have relatively little pest or disease pressure. While it is possible for pest such as cutworms, root-knot nematode, tobacco budworm, and whiteflies to feast on tomatillo plants we’ve not encountered any of these. Nor have we had black spot or tobacco mosaic virus which are common diseases that affect nightshade plants. Because the tomatillo is covered with a papery husk insects tend to pass them by. However, we have had some leaf-footed bug damage towards the end of the season. It could be because there’s very little else in our garden at the time and it’s all the leaf-footed bugs can find to munch on. The damage is minimal compared to what these bugs will do to a tomato. So, when are tomatillos ready to be harvested? Well, that depends on how tart you like them. Tomatillos are ready to harvest when they have filled out their husk. You’ll need to gently squeeze the husk to test it. If they husk is broken then it’s ready to harvest. Some people like to wait to harvest tomatillos once they’ve fallen to the ground. The flavor of truly ripe tomatillos is more mild than the flavor of dark green, unripe tomatillos. Try both and see what flavor you like best. If a frost is coming and you still have tomatillo fruit on the plant, you can either pick it early (if you like the unripe fruit) or pull the whole plant and hang it upside down in the garage to let the tomatillos finish ripening. Tomatillos can be stored for a few days on the counter or refrigerator. For fresh storage keep the husks on the tomatillo. We usually freeze our tomatillos to store them. Remove the husks and wash the sticky substance off the tomatillo, you might need to use soapy water to get it all off. 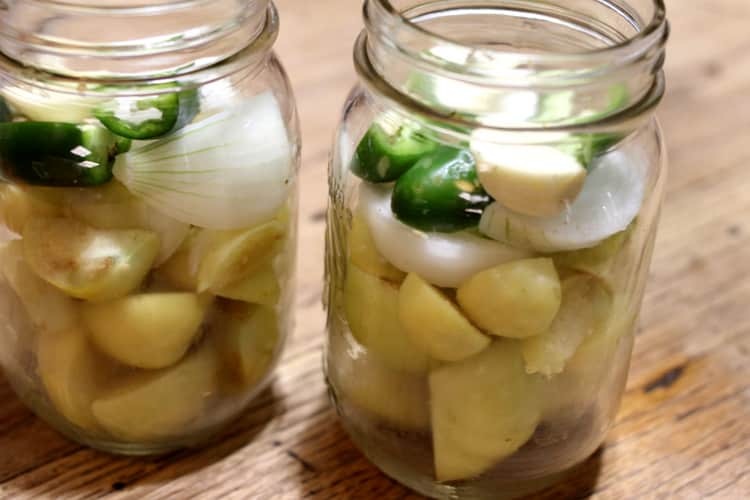 Dry the tomatillos and put in a freezer safe storage container; this can be a ziplock bag, old ice cream bucket, or even glass jars. We usually use old ice cream buckets to freeze tomatillos. There’s no need to cut them or remove the skin. I have experimented with putting all the ingredients for tomatillo salsa in mason jars for freezing then thawing them out and blending them in the jar like I do pesto. If you have the freezer space, it’s a good option. Tomatillos can also be water bath canned. Of course the most common canned tomatillo recipe is canned tomatillo salsa verde. You can also can whole tomatillos. This is a great idea if you don’t have a lot of freezer space but want whole tomatillos to use later. Tomaillos an also be fermented or dehydrated. I don’t normally preserve tomatillos in either of these ways but they are options. If I were to ferment tomatillos I would slice them and ferment them just like I ferement peppers. To dehydrate tomatillos, slice them and dehydrate them at 135°F F until fully dry (about 6-8 hours). Store the dehydrated tomatillo slices in an airtight container. They should be good for us to a year. A quick internet search will tell you that the most popular way to use tomatillos in to make tomatillo salsa verde. But there are other ways to use tomatillos. I like to make a creamy avocado green salsa with them. It’s takes salsa verde to the next level. Just puree an avocado, a tomatillo, a garlic clove or two, a tbsp of sour cream, and a bit of salt together until creamy. I also like to add chopped or pureed tomatillos to my creamy chicken chili. Or make this chicken and roasted tomatillo soup. If you’re a fan of gazpacho you can try this green gazpacho recipe. Just like green tomatoes, tomatillos can be sliced, breaded and fried. 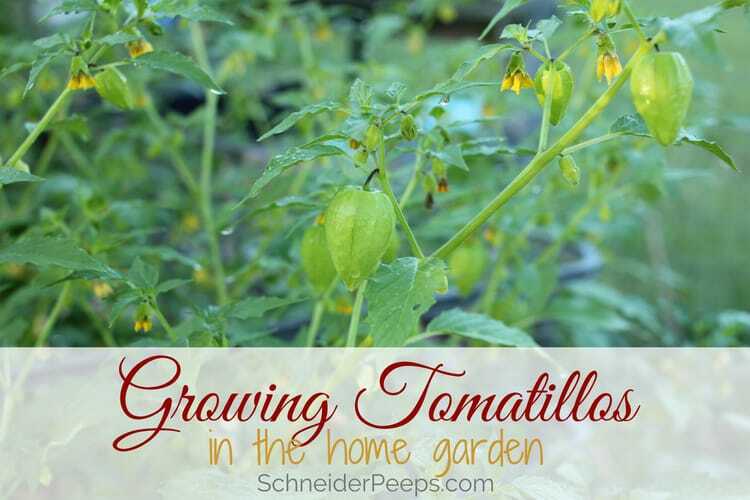 Do you grow tomatillos? Feel free to share to share your tips for growing tomatilloes or your favorite tomatillo recipes in the comments. Depending on when you get your first frost it might be too late for much fruit. I would suggest using a small artist’s paint brush to transfer the pollen from one plant to another, that would work better than trying to just use the flowers. Hopefully next year you’ll have more pollinators.